Hello my friends , In this article we will explain how to repair USbest chip controller .Usbest developed a new software that can format and repair Usbest chip controller .Cool Flash Format Tools allows you to format most of USbest controllers such as USbest UT161,UT162, UT163, UT165, UT190, IT1167, IT1168, IT1169, IT1170, IT1171, IT1172 and IT1180 chip controller .Follow the following repair tips and fix your corrupted USB flash disk . Download Cool Flash Format Tools package that contains different repair versions that can fix USbest chip vendor . Insert your USbest USB Stick to your computer . Try every version of Cool Flash Format software until you repair your flash drive . 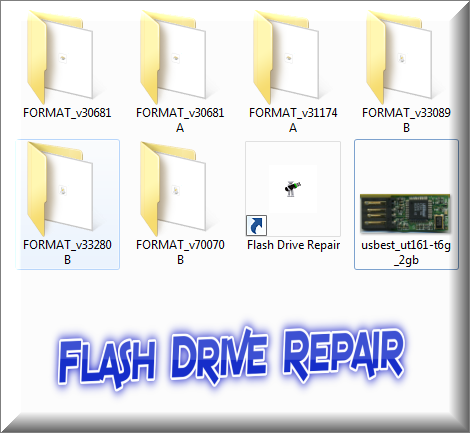 Cool Flash Format Tools support repairing USBest UT161, UT162, UT163, UT165, UT190, IT1167, IT1168, IT1169, IT1170, IT1171, IT1172 and IT1180.